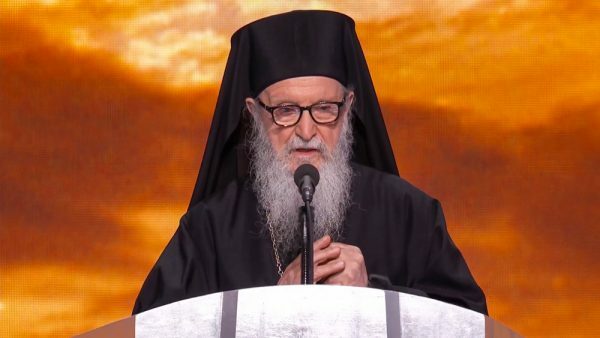 NEW YORK – His Eminence Archbishop Demetrios, Primate of the Greek Orthodox Church in America, offered the Prayer of Invocation today, Thursday July 28, at the Democratic National Convention in Philadelphia, Pa. 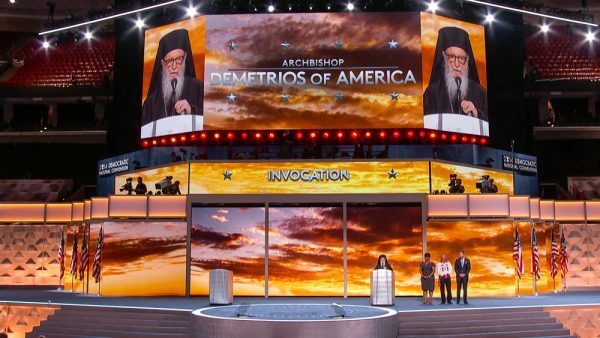 In the long established tradition of the Greek Orthodox Archdiocese to offer a prayer in both the Democratic and the Republican Conventions, Archbishop Demetrios was invited by the Democratic National Committee and was introduced by Kevin Washo, executive director of the Philadelphia 2016 DNC host committee. His Eminence delivered the invocation at the beginning of the fourth and last day of the Convention, just before the nominee for President of the Democratic Party, Senator Hillary Clinton, was to officially accept the nomination. (See text of invocation below). Earlier in the day, a DNC Greek American reception and luncheon in honor of Archbishop Demetrios was hosted by Ambassador Eleni Tsakopoulos Kounalakis, Denis Mehiel, and Andrew and Mike Manatos. Many members of Congress, White House senior staff, officials and Greek American leaders were in attendance including John Podesta, chairman of the 2016 Hillary Clinton presidential campaign and chief of staff to President Bill Clinton; Michael Dukakis, former governor of Massachusetts and presidential candidate in 1988; Senator Paul Sarbanes, Dina Titus, U.S. Rep. (D-NV); Chris Van Hollen, U.S. Rep. (D-MD); John Sarbanes, U.S. Rep. (D-MD); and Carolyn Maloney, U.S. Rep. (D-NY). Last week, Wednesday July 20, His Eminence offered a prayer at the Republican National Convention in Cleveland, Ohio. At this auspicious day and hour, we call upon your great and holy Name, and we ask that you come to us and abide in us, illuminating our minds and souls with the light of your truth and your goodness. You have revealed yourself as the defender of the poor and the guide of the blind, as the protector of orphans and the liberator of the oppressed, as the friend of the foreigner and the consolation of the outcast. Open our hearts to become more like you, O compassionate One. Teach us to walk in your gracious and generous ways. Bless our nation today, O Lord, even as you blessed us so richly in years past. Grant us stability and security, justice and freedom, righteousness and peace. Appoint for us leaders and legislators and judges who will guide us to fulfill your holy will and to build a better world for all people. Send your mercies upon these your servants, the delegates of the Democratic National Convention. Bestow grace on those they have nominated for the exalted and awesome offices of President and Vice President of the United States of America—Hillary Rodham Clinton and Tim Kaine—so that they may be faithful in their calling, and may honorably serve you, and our fellow citizens, and all the peoples of the world, through their conduct in the days and months and years ahead. We embrace your holy words, Lord, believing that “righteousness exalts a nation” (Proverbs 14:34). Holy God: exalt and lift high these United States of America, to follow in your righteousness, your mercy, your compassion, your unconditional love; and to walk in your truth that sets us free, and will keep us free. And so we pray reiterating the words of the Bible: “Blessing and glory and wisdom and thanksgiving and honor and power and might be to our God unto the ages of ages! Amen” (Revelation 7:12).